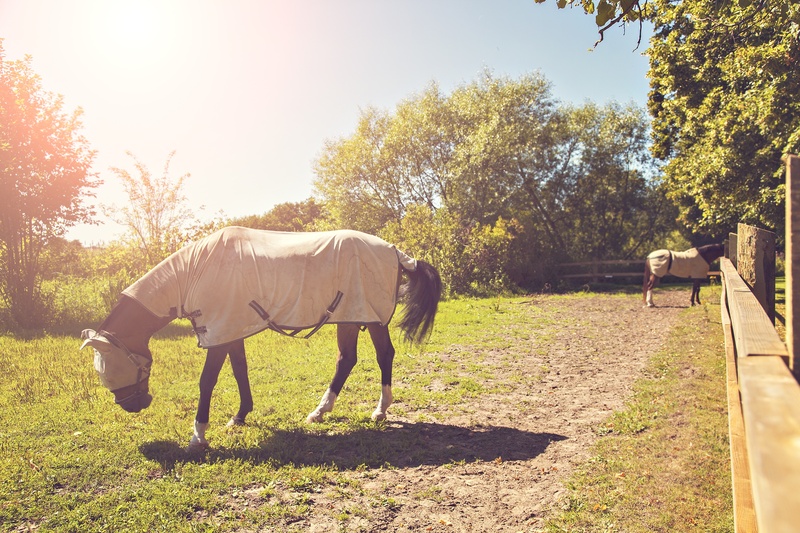 Flies pose a serious threat to the well-being of your horses. Flies can bite horses, creating painful sores that can become infected. Some species even grow inside horses' stomach lining. The sooner you take care of these insects, the better off your horses will be. Fly repellents can be effective against horn flies, horse flies, house flies and stable flies. Apply spray or wipe-on repellent to your horse's ears, neck and back to prevent bites. Also consider creating a perimeter barrier with repellent along the outside and inside of your stables. Stables are the prime breeding grounds for fly larvae. 2. Keep Your Stables Clean. Remove the old bedding from stalls and sheds. Old, soiled bedding will attract flies and other pests. Muck out dry pens and lots. Harrow pastures. Break apart manure piles and try to keep them away from the stable area. Consider putting sand in areas saturated with manure. 3. Treat Your Horse With Dewormers. Bot flies are notorious for causing gastrointestinal problems inside horses' intestines. Regularly treat your horse with dewormers to kill off any larvae that your horse may have consumed. If you see any fly eggs on your horse's hair, remove them with a bot knife. 4. Fly Sheets And Masks. Prepare for fly season by stockpiling fly masks and sheets. Try to have at least a full month's supply available at all times. Just be sure to inspect any older masks and sheets for rips and tears. Fly barrier products that have not been used in the past year should be thoroughly checked for such weak spots. Try to mend these areas. Or, you can replace them to guarantee effective fly prevention. 5. Automatic Fly Spray Systems. Protect your horse even while you're away by installing an automatic fly spray system in your stable or barn. Most systems are easy to install and fit up to a 4 stall stable. Refill the system as needed. Remember to spray your horses when you take them out to graze as well. Flies are more than a nuisance. They can transmit diseases, cause painful bites and sores, and impact horses' gastrointestinal health. The best way to protect your horses is to follow the steps above. Help your arena last for years to come. Our infographic will teach you five easy tips for maintaining and dragging your arena footing.